Memorial Day weekend always seems to be one of most productive times of the year here in Michigan, and this year I was able to take a trip to northern Michigan over the holiday weekend with my good friends, Chris and Matt Boguslawski. 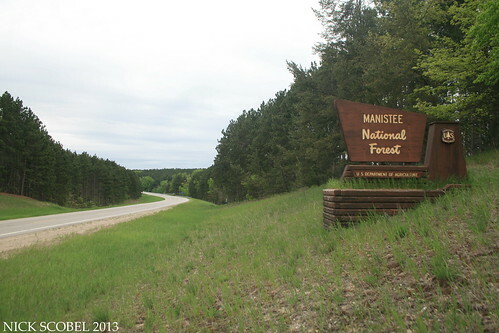 The guys have a cabin up in the Manistee National Forest, probably the most beautiful natural area in Michigan's lower peninsula. 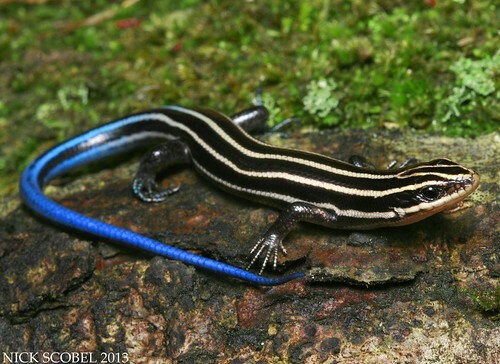 This huge expanse of forest is also home to some of the state's more elusive herpetofauna. I met Chris early on Sunday morning, and we headed northward. Along the way, we decided to pit stop along the west side of the state to look for Black Rat Snakes (Pantherophis obsoletus), arguably one of the toughest snakes to find in the state, but we struck out. By the late afternoon, we arrived at our destination for the next few days. After dropping our things off at the cabin, we picked up Matt, loaded our gear, and set out for the evening to a few spots Chris new of. Our first stop was a small meadow amid a jack pine forest which had several boards and other cover scattered throughout it. After a few minutes of flipping with no luck, we decided to move one. But as we were leaving, Matt spotted this large snake coming out of a large leaf pile. Not the prettiest milk I've ever seen, but large and impressive to be sure. This adult was in shed and had a rather nasty looking sore on the tip of its snout. We snapped a few photos and moved on. While driving towards our next stop, we cruised a large DOR blue racer which had been hit earlier in the day, this would be the only way we would see racers the entire weekend. Our next spot was a small bridge crossing near a river. While traversing the area, we found this snake out on the move in the late evening, a welcomed surprise that all of us were excited to see. 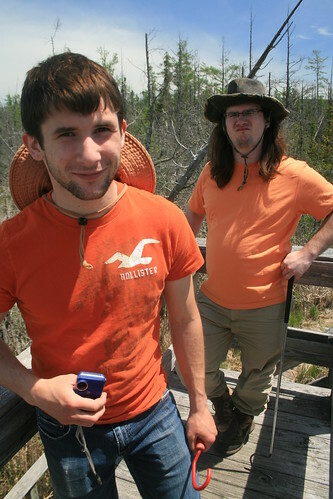 This was Matt's first Michigan hognose, and Chris's first hognose in Michigan since we was in his teens. Even for me, this was the furthest north I've ever seen one in Michigan. 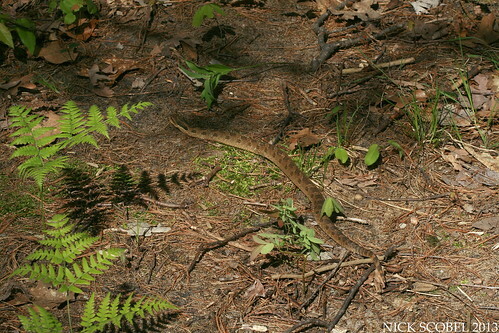 It had a wonderful sandy brown coloration that you don't often see in individuals from the southern lower peninsula. We got to see the full show, which is a typical display for this species. 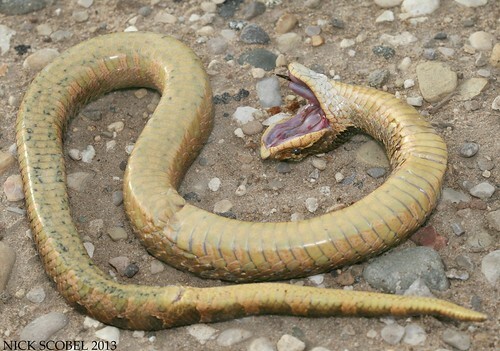 You can even notice some of the blood being discharged from its mouth, hognose snakes make every effort to make their death feigning as realistic as possible. 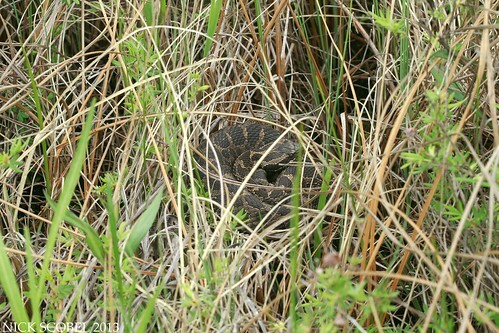 We parted ways with the snake and headed back to the cabin for a well cooked meal. We arose early the next morning and headed further north to some boggy wetlands. Around noon, we arrived at this location. 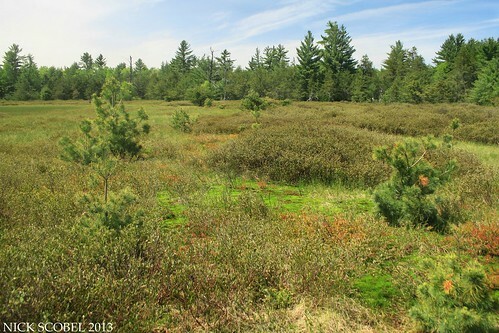 This large conifer swamp is home to Michigan's only venomous snake, the eastern massasauga. 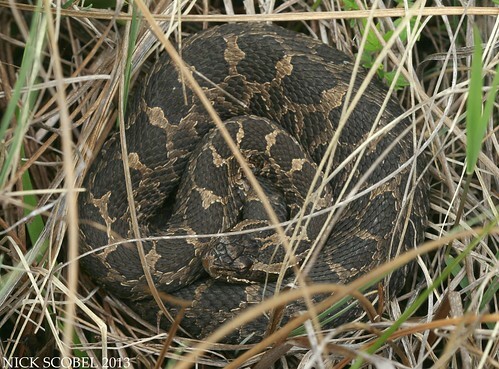 Temperatures were warm and the skies were hazy, perfect weather conditions for basking rattlesnakes. We spread out into the area, carefully stepping through the spongy terrain. While I was curling around the base of a tamarack tree, a dark shape managed to catch my attention. A sharp looking rattlesnake, this small adult was coiled right out in the open attempting to warm up in the hazy sunlight. We didn't bother it much, other than for a few quick photos. Massasaugas are always a treat, especially when you find them further north in the state. We walked around a bit more and flipped an in-shed juvenile milk snake. I also managed to catch Chris and Matt at a rather inopportune moment, well for Chris anyways. Our next location took us about thirty miles from where we had been to an isolated two-track in the middle of nowhere on state land. Eventually, we found ourselves at a crossroads between the two-track and an ORV trail. A short distance away, we entered this gorgeous site. As soon as we entered this bog, I looked at the guys and exclaimed, "we're going to find a green snake here." The ground was damp and carpeted with bright green moss. 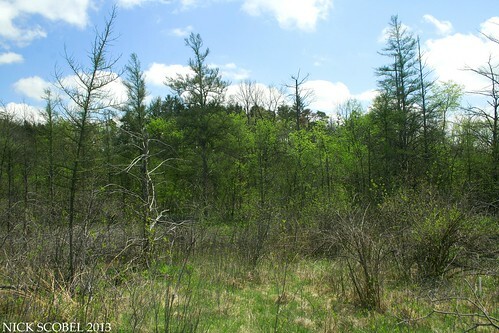 Scattered patches of leatherleaf and sedges looked like ideal cover. We spread and and scanned the area slowly. 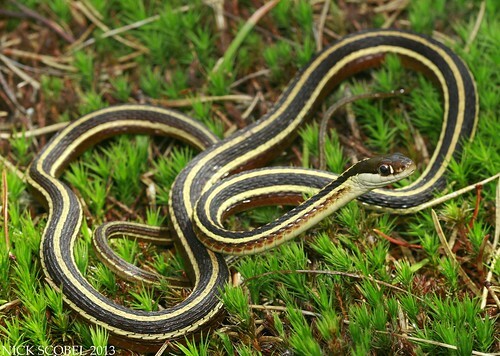 Within a few minutes, I spotted this pretty ribbon snake moving around in a small seepage. 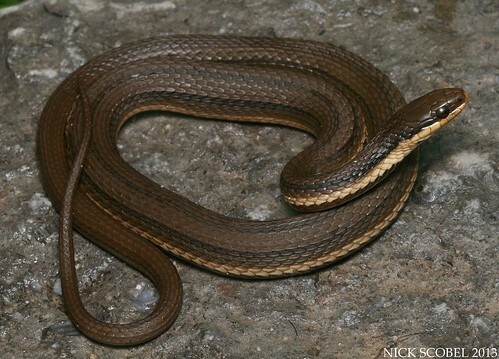 We ended up seeing a few more ribbon snakes and the lone garter snake we would see the entire trip. 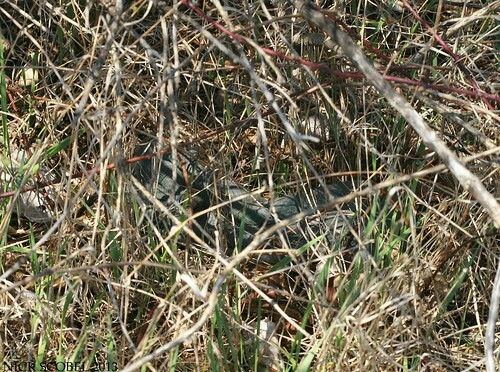 We continued to walk carefully through the area looking for a moving piece of grass. 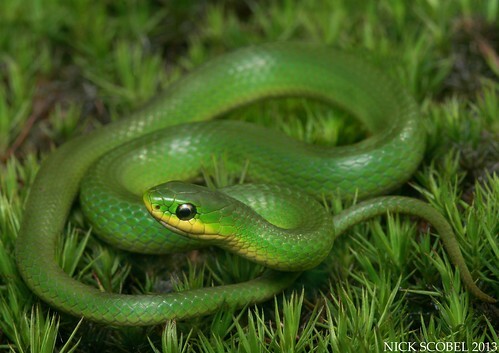 Suddenly, Chris called out, "Green Snake!" Matt and I ran over to see Chris staring at a thick patch of sedges, he had lost the snake. 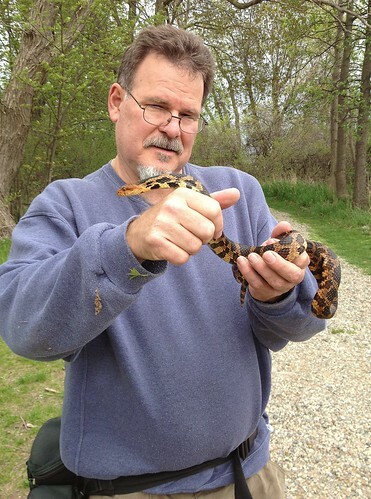 We spent a minute carefully looking through the sedges and Chris managed to make a quick grab on this yearling green snake, my first on the Michigan mainland. There was some rejoicing between the group, this is a snake that had been on the guys list for quite some time. We spent a few minutes photographing this little guy, and then moved on. As nice as the juvenile was, I wanted to see a nice adult. As I was traversing one patch of the bog, a slight movement in the grass drew my eye to this gem. If it hadn't moved, I would have walked right past it, the camouflage on this species is amazing. 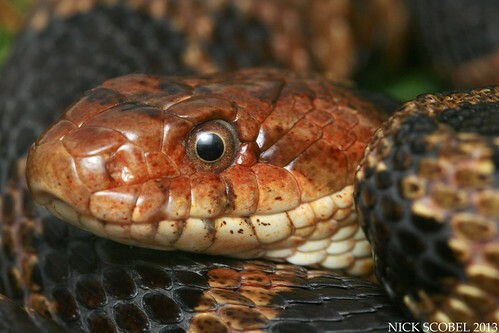 This was a healthy adult, and is easily one of my favorite snakes which is found in the Great Lakes region. Sadly, this species seems to still be declining in the state. It was once common throughout much of the lower peninsula, but has since become rare or absent from much of its former haunts. 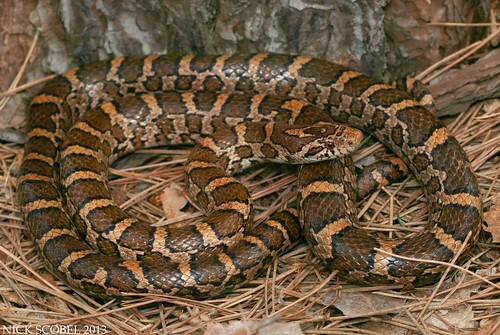 It does remain locally common in the Upper Peninsula, but is only found in a few scattered locations in the northern lower. 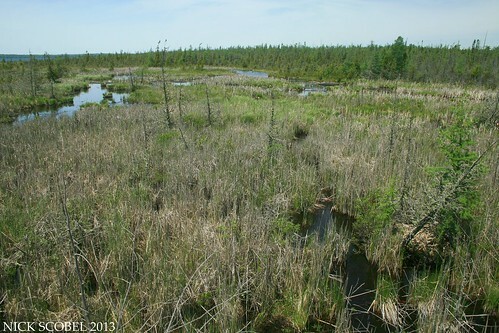 Likely the large reason for its decline is the conversion of meadows and wetlands to agricultural lands. 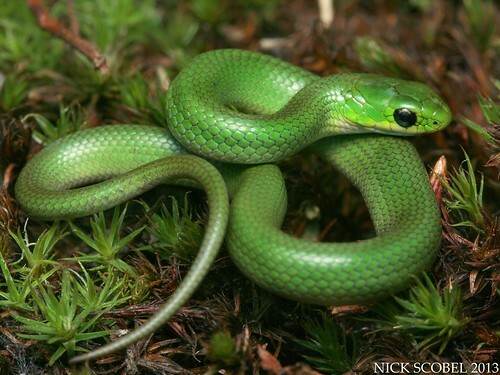 Green snakes are strictly insectivorious, and because many agricultural operations spray pesticides, it seems as though green snakes have been affected just as much as the pests. Places like this are few and far between in the lower peninsula, and to see that this species is still hanging on in some areas is encouraging. We made the drive back towards the cabin and stopped at Jamesport Brewing Company in Ludington, where I enjoyed a guacamole burger and two of their Scottish Strong Ales. If you're a beer lover, a highly recommend a visit to the place if you're near Ludington. The next morning brought rainy weather, but we endured and headed out into the field. 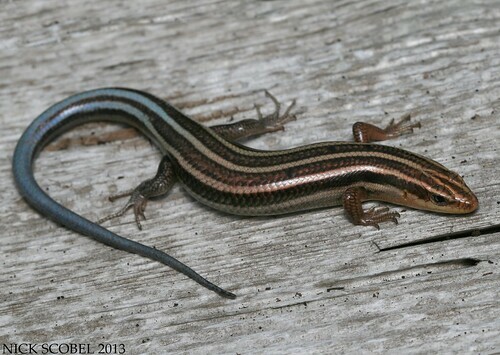 Flipping cover was the name of the game on this day, and we managed to find two five-lined skinks under cover, including one gorgeous juvenile. As the day went on, several heavy thunderstorms passed through the area. So to kill time, we drove many roads across the area in hope of seeing a box or wood turtle out enjoying the weather, unfortunately we struck out. By the late afternoon, the rain finally quit and the land began to dry out. We pit stopped along a stream corridor and flipped a few rocks and managed to find a few snakes, including a queen snake, my first from this far north in the state. The queen was definitely an exciting find, it seemed as though each day of the trip had provided a great find. And the day wasn't over yet, so we decided to go walk a clearing that Chris had checked before and thought it looked good for blue racers and hogs. 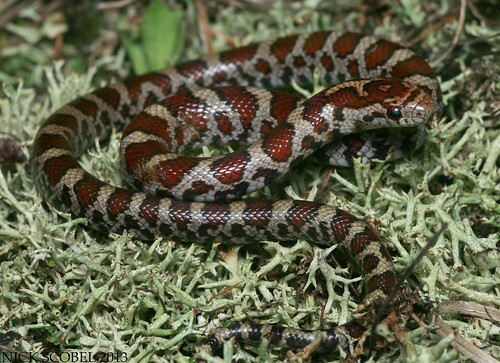 We flipped a small log in the middle of the clearing and found our fourth milk snake on the trip, and the third county we had seen one in. We continued to traverse the clearing. 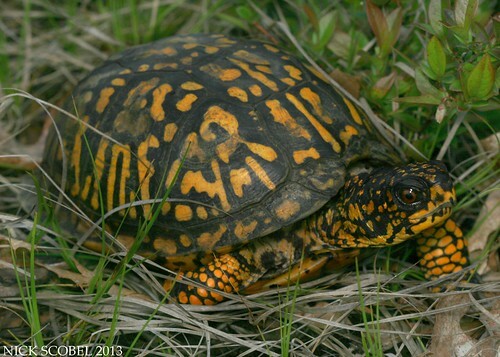 While moving through a small area of shrubs in the center of the area, Chris called out, "Box turtle!" 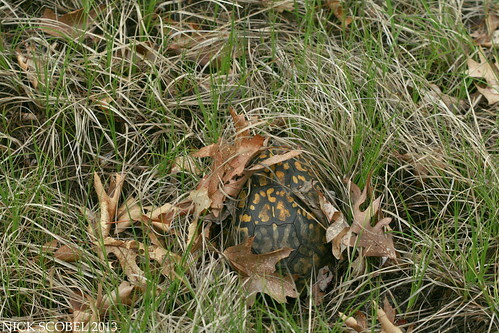 Matt and I quickly ran over to see this sight, a typical fashion to find a box turtle indeed. I hadn't seen a box turtle in Michigan for a few years, so this was an encouraging find. Northern Michigan is the northern limit of this species' range in the United States, they are scarce and uncommon in the state. This was also a gravid female, likely utilizing this open clearing as a staging area for nesting in the coming weeks. It capped off our third fantastic day in a row. The next morning, we packed up and began the lock trek home to southeast Michigan but decided to make one last pit stop along the way. We headed out to a small wet meadow in hopes of seeing some turtles. The weather was warm, and the skies were overcast, perfect conditions for the species we were hoping to see. 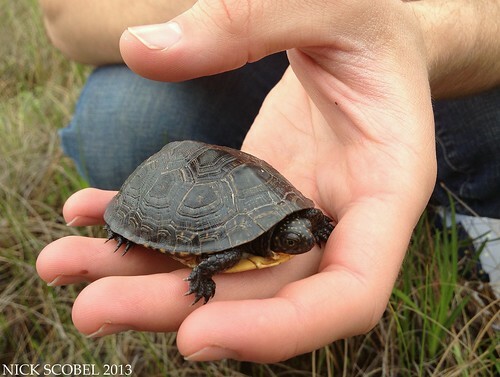 Our first find was this juvenile Blanding's Turtle, an uncommon sight these days it seems. 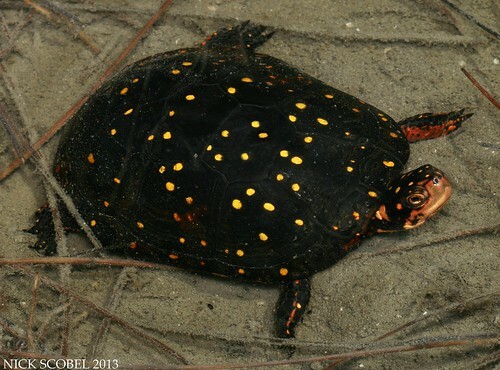 Like many imperiled turtle species, Blanding's Turtles face a major threat from raccoons due to high nest predation. Adult members of this species seem to be in no short supply, but many are upwards of 40-50 years in age. Juveniles like this seem to be scarce, indicating there is low recruitment. So, finding one in this age class is always a good sign. We let the little fella on his way and continued to scan the area, within a few minutes I spotted this gorgeous turtle basking in some sedges. This gorgeous female was one of the nicest individuals of this species I've seen. We snapped a few photos and then continued the drive home, it was a great way to close an amazing trip. I'd like to thank Chris and Matt for their hospitality, and for probably the best few days in the field I've ever had in Michigan. I hope to do it again sometime. Until next time, happy herping. Hello, everyone! It's been quite an absence since my last blog entry. It's been another odd spring here in Michigan, while it came a month early in 2012, the spring has arrived about a month late in 2013. Things have been out, but not in big numbers like I've seen in years past. Near the end of April, I jaunted down to the southwest corner of the state to explore some new areas. I pit stopped at an area along the way to take a quick look for a few species. It didn't take long, as I found this pretty girl out and about. 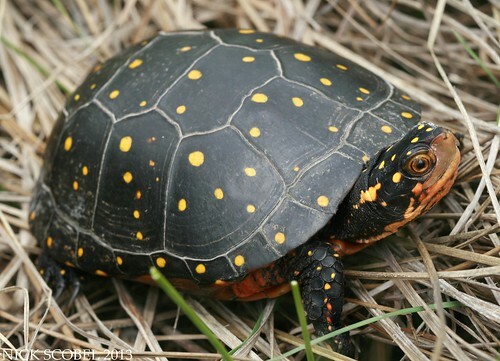 Female spotted turtles feature a bright orange chin which makes them easily distinguishable from males. This turtle was cooperative enough to let me shoot a few quick photos. A few more turtles were seen moving about the wetland during my short visit, but I also managed to stumble across a few snakes. 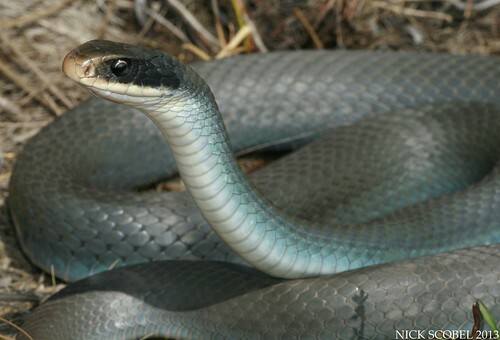 Blue racers are always a treat. This large individual was found basking in the open, and after a quick chase I was able to apprehend it for a few quick photos. Temperatures continued to climb into the low 70s, perfect weather for massasaugas to be out. For whatever reason none made an appearance on this day, much to my chagrin. 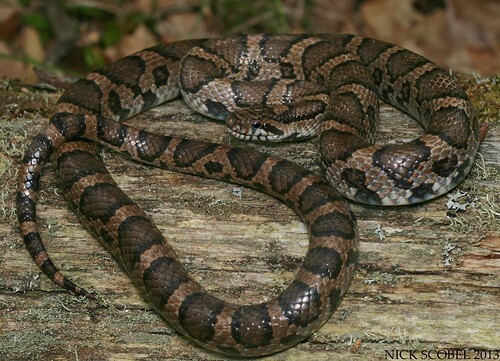 A good friend of mine was out on the east side of the state on this day and had temperatures that were considerably cooler, and he saw three massasaugas out basking. Needless to say, I was a little bit frustrated. My field time was limited in the following weeks, but I did manage to get out on a cool weekend afternoon. 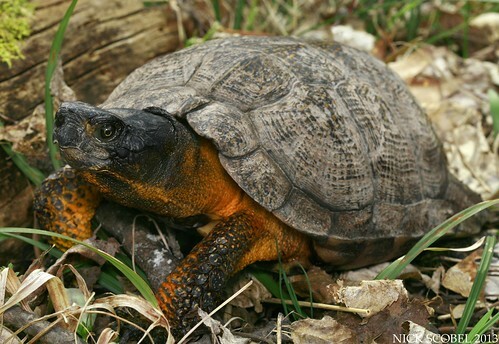 While walking along a river corridor towards a tin site, I stumbled onto this large male wood turtle. After snapping photos, I continued upriver to a small clearing I've been to many times to flip some tin. The habitat in this area looks promising for hogs and green snakes, though neither have shown up as of yet. 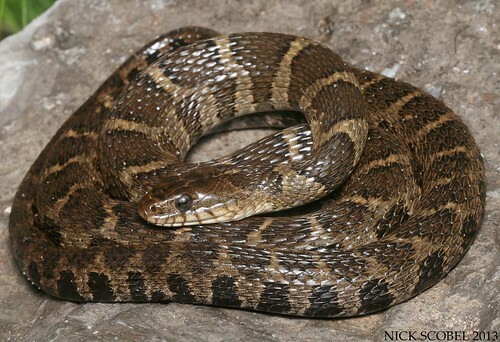 But I did manage to flip this large milk snake under a sheet of tin, a large female I've seen before. A week or so later I went out with a CMU graduate student who's doing research on blue racers to a spot not too far from campus to hopefully take some blood samples for genetic analysis. Temperatures were scorching for this time of the year and we arrived at high noon. Luckily, I was able to spot this adult taking shelter in the shade of a briar patch. 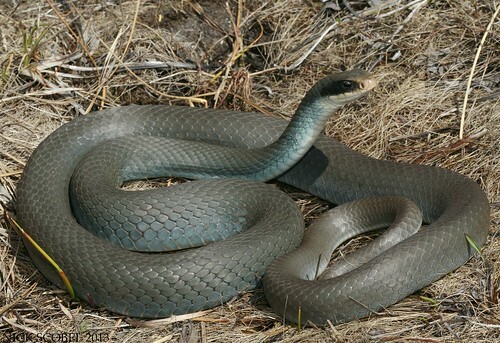 Racers from this population seem to be more blue than any others I've seen in the state and feature a jet black head, truly gorgeous. We ended up seeing a grand total of three, not too bad considering the temperatures were in the mid 80s. A few weeks later, Tim Warfel and Mike Pingleton came up for a short weekend trip to see a few different species. Michigan weather can be described as temperamental at this time of the year, and despite warm temperatures earlier in the week, the Saturday forecast was for partly cloudy skies and temps only reaching the high 50s. When we met early in the morning, it was overcast and in the high 40s. 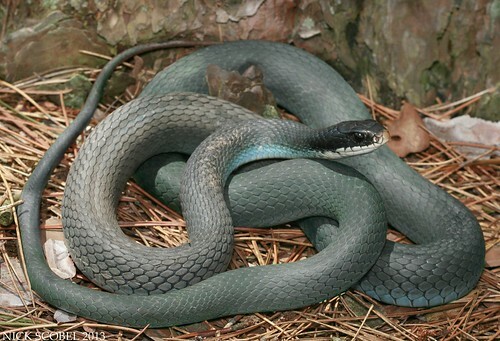 We made a jaunt to an open meadow and managed to score a blue racer basking in the cool weather. After getting on the board, we headed over to another location and quickly scored a Butler's Garter Snake (Thamnophis butleri). 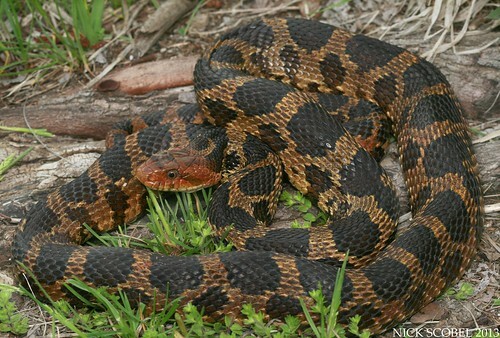 As we were photographing the snake, the clouds parted and the temps quickly rose into the low 60s. We quickly moved to this fantastic prairie fen. We spread out and walked carefully through the fen, checking around the edges of small shrubs, sedge tussocks, and tamarack trees. After a few minutes, Chris called out that he had found the snake we were looking for, a snake that Tim had traveled 2,600 miles to see. 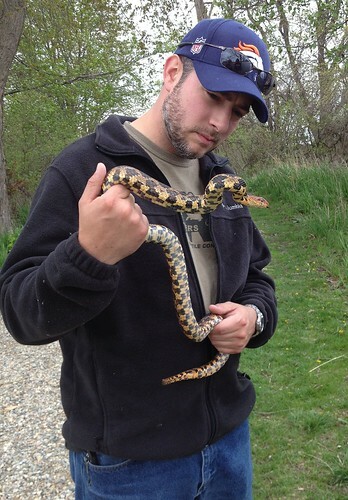 A healthy adult male, this snake was warmed up and jumpy. We were able to get him to coil for a minute or two to snap some photos and then let him on his way. 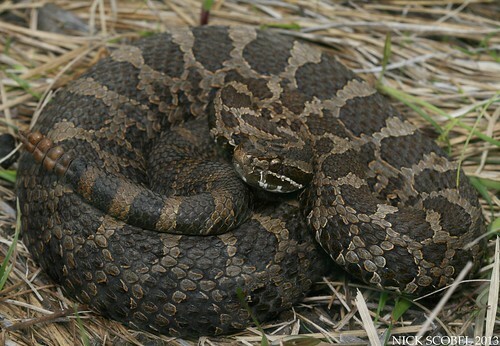 It was exciting for Tim and Mike to be able to see one of these guys after a long trip, and also for me as this was my first massasauga of the 2013 field season. We packed up our gear and moved on. It was the middle of the afternoon and because we had crossed off a massasauga on the list, I asked Tim and Mike what else they would like to look for since we had the afternoon to kill. 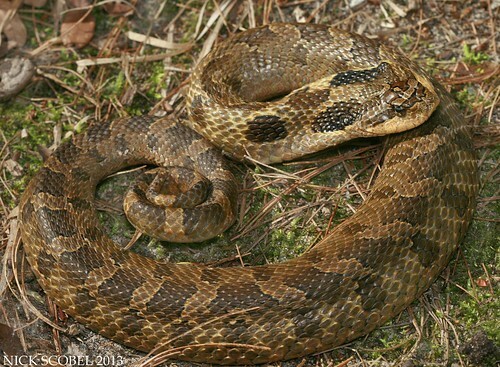 They asked how likely it would be to find an Eastern Fox Snake (Pantherophis gloydi) at this time of the year. I told them that it was hit and miss, but we would have a chance if we decided to go for it. We jumped in the car and booked it down to extreme southeast Michigan. 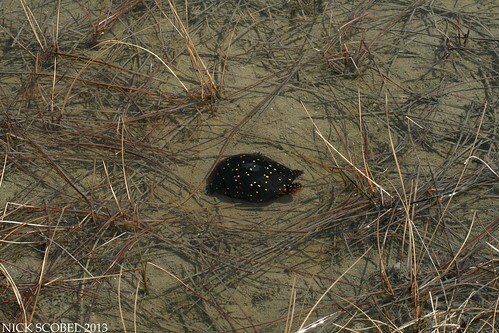 After walking some coastal marsh for some time, Chris flipped a large rock which revealed this beauty. 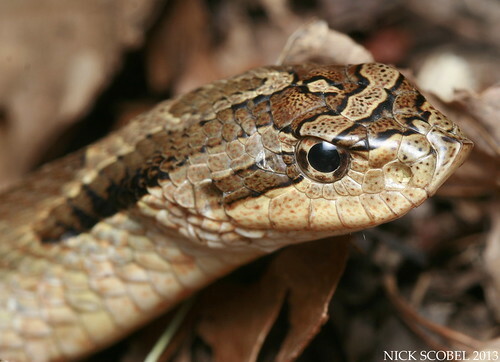 We finished a day of cool weather with a rattlesnake, fox snake, butler's garter, and a blue racer. Given the weather conditions, we were all quite satisfied. We closed the evening with a few beers, great food, and a lot of laughs at the Brown Jug in Ann Arbor. I want to thank Tim and Mike for a great time in the field, I hope to see them again this year down in Croatan.